The promise of robotic-assisted surgery and the exacting tradition of hand-sewn sutures come together under one roof, in a new surgical training center on Blalock 12. In an operating room at Johns Hopkins Hospital, about 30 medical students in green scrubs and white lab coats practice tying knots -- perfecting their suturing techniques. Phillip Rand Brown, Hopkins associate professor of surgery, is walking around the narrow tables, closely watching the purple-gloved fingers. "Did you tie it off?" he asks one student. "Now," he pauses, before addressing another. "Stop for a second. What's wrong? It didn't loop around." And yet another tip: "Look at the way you started out," Brown says. "You have to cross your hands." The students nod eagerly and stitch again. In a smaller operating room across the hall, a urologist is practicing tying knots as well. But the monofilament nylon he's looping and pulling is several feet away from his hands. As he works, the surgeon is looking at a 3-D camera image of the operative field, where mechanical silver hands are gently threading a suture. In this operating theater, a robotic assistant is "closing" on the patient. Both scenarios are part of the training mission at the Johns Hopkins-U.S. Surgical Minimally Invasive Surgical Training Center (MISTC), which provides lab sessions for inexperienced surgeons, as well as tutorials in cutting-edge medical technology such as robotic-assisted surgery. "On the one hand, we are teaching techniques taught since the Egyptian time period: Young surgeons learn how to tie knots before they work on a person," notes Brown, MISTC director of education. "We are also training future surgeons in future techniques." Third-year Hopkins medical students hone their suturing techniques in the MISTC lab. Launched a little over a year ago with $3.2 million in funding from U.S. Surgical Corporation, the lab at Blalock 12 has served over 1,500 Hopkins medical students, residents, and surgeons, as well as visiting physicians and members of medical associations attending lectures. A suite of rooms on the 12th floor, MISTC (pronounced mystic) offers an Internet-linked lecture hall, surgeon's scrub room, two state-of-the-art operating theaters, and other surgery prep rooms. Among the center's goals: to provide training that can reduce time spent in the operating room at Hopkins and other teaching hospitals, and to give surgeons simulated surgical environments in which to practice with evolving technology and instruments. Paul W. Flint, Hopkins professor of otolaryngology and MISTC co-director, plans to use the robotic system in head and neck surgeries: "Any new technology has associated with it potential complications," Flint says. "This helps to remove that component. It takes some of the training out of the operating room." On a cold afternoon in January, the third-year medical students first gather in the lab's lecture hall, perusing hand-outs that detail various surgical sutures -- Lembert stitch and whip stitch -- as well as illustrations of sponge forceps, towel clips, needle drivers, and other surgical instruments. Brett Nelson says he's benefited from the new lab's approach for novice surgeons. "It is needed. Oftentimes we don't get all the hands-on experience we want in the OR," says Nelson. "It gives us the opportunity to practice, and not on patients." For many decades, Hopkins offered such a surgical lab course, first developed by Hopkins surgeons at the turn of the 20th century. The course continued into the late 1990s, closing down due to financial constraints, including the costs associated with animal subjects. Brown, who stepped in to the void to develop the new course, says, "There is a huge tradition of training in surgery here at Hopkins. A lot of medical schools [have] copied us." Blalock 12 is in fact rich with the the spirit of medical innovation. The building is named for Hopkins surgeon Alfred Blalock, and the 12th floor housed his research labs. Blalock, along with Hopkins pediatrician Helen Taussig and surgical assistant Vivien Thomas, developed a medical procedure in the 1940s to correct a congenital heart defect in children, resolving what was known as the "blue baby" syndrome in which the heart did not pump sufficient blood to the lungs. Such surgery was previously deemed too risky. Decades before Blalock's contributions, noted Johns Hopkins physicians were making pioneering contributions to the world of surgery -- from William Halsted's successful implementation of the first radical mastectomy in the late 1800s, to Walter Dandy's daring removal of brain tumors in the mid-1920s. In more modern times, Hopkins surgeon Patrick Walsh has dramatically altered the outcome of prostate cancer surgery with his nerve-sparing prostatectomy. 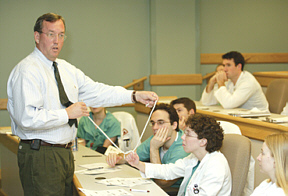 Professor Phillip Rand Brown guides his students in the art of making precise surgical sutures. Brown is enthusiastic about the range of opportunity offered by MISTC. "On the one hand, we are teaching techniques taught since the Egyptian time period. We are also training future surgeons in future techniques." "You cannot work here without being aware of that heritage," Brown says. Such history, not surprisingly, has laid the groundwork for ever-developing medical innovations at Hopkins. MISTC leaders hope that future innovation will become a hallmark of the lab. "Aside from training surgeons, we are involved in research and development," Brown adds. "Not to be arrogant, but we want to strive to be in a leadership role in shaping patient care in the future." 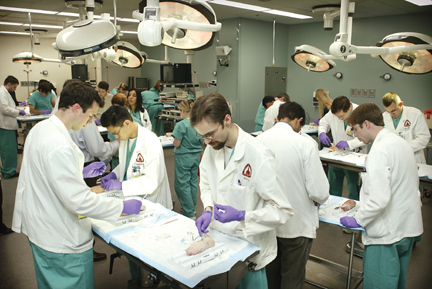 Through various short courses, surgeons and students can tap a broad spectrum of surgical training, using inanimate objects, such as rubber bands, as well as lab animals and cadavers. New surgical techniques and tools can be tested here. "It puts us on the cutting edge," notes David Alexander, MISTC lab administrator, and administrator of General Pediatric Surgery. 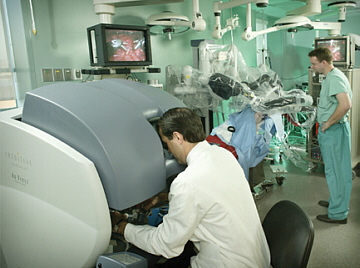 Robot-assisted surgery, for example, is being used in Hopkins operating rooms and elsewhere by surgeons conducting laparoscopic procedures in general surgery, and urology, cardiac, and transplant surgeries, and it's being tested for use in other specialties, such as otolaryngology, neurosurgery, and gynecology. The system here, known as the da Vinci Surgical System, utilizes a $1 million machine Hopkins leases from its developer, Intuitive Surgical Corp. There are two such machines at Hopkins, including the one in the MISTC lab and another in the Weinberg OR. Hopkins surgeons, nurses, and surgical technicians have trained in the MISTC lab, though medical students aren't yet using the robot. The lab itself is one of only five in the country that offer such training with robot-assisted surgery. The da Vinci system does not approach the status of autonomous robotic surgeon. It's more like a super- high-tech instrument: The surgeon peers into a gray console -- much like the replay console used by referees during televised football games. 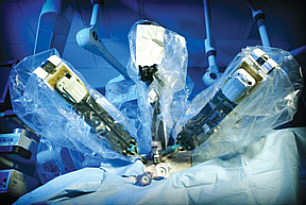 A spidery array of robotic arms is positioned over the patient. Those robotic arms are attached to laparoscopic instruments that are inserted through small incisions in the patient. Therein lies the difference from traditional laparoscopic surgery, in which surgeons rely on open-and-close clamps on the tips of the long, thin instruments they manipulate with their hands. Using the robotic system, surgeons instead manipulate handlike controls in the console. Their hand and wrist motions are then translated into corresponding, precise movements of versatile "hands" on the end of the laparoscopic instruments. These robotic-assisted "endowrist" instruments give surgeons a wider degree of motion and provide more precise movement during suturing and cutting of tissue, according to Intuitive Corp., which runs courses for visiting doctors at MISTC. The robotic system also helps reduce hand fatigue and tremors during surgery. Peering into a console, Paul Flint, co-director of the MISTC lab at Hopkins, can observe an operative field and manipulate hand-like controls (below, right) that remotely activate robotic "hands" on the end of laparoscopic instruments (below, left). Visiting urologist Daniel Holmes, of Kansas City, Missouri, looks on. Urologist Daniel Holmes of St. Luke's Hospital in Kansas City, Missouri, was training at MISTC in late January, removing a kidney from a pig using the da Vinci system. "There's nothing better than a surgeon's hands during surgery," he says. "But with laparoscopic surgery we can't use our hands anyway. We use instruments. [The robotic system] is more like what we can do with our hands. And the benefit is, you don't have a big incision." The potential for robot-assisted laparoscopic surgery is vast: If the console can be seven feet away, it could also work many miles away, using images carried over phone lines or the Internet. Through telesurgury, surgeons in the United States, for example, can operate on someone across the globe. One such surgery was conducted in fall 2001 by surgeons at Mt. Sinai Medical Center in New York, who removed the gall bladder of a 68-year-old woman in Strasbourg, France. "One of the missions of the center is to develop virtual technology that eliminates the need for surgeries on animals. We would like to expand into virtual surgery using computer models with robotic instruments," says Flint. "It allows for the potential of operating at a great distance," Flint says, noting that there are military medicine possibilities, among others. "Emergency medicine and the management of critical wounds could be potentially performed in a MASH unit. And NASA could use the technology to operate on someone during space travel." Such instruments and procedures are still evolving (Brown, looking to the future, says the current robot is the "Model T" version). Among other drawbacks, there is the issue of time delay in telesurgery. Whether phone lines or the Internet is used, a partial second delay could cause the surgeon to respond less quickly to bleeding. And though the robot reduces hand fatigue during surgery, the surgeon can't feel the response of the tissue he or she is cutting or cauterizing -- what's known as "haptic" feedback. Each new medical advance, after all, brings benefits and challenges. And that speaks to future endeavors at MISTC, according to center directors. Brown hopes to bring in simulators -- computer-based virtual surgical theaters (sort of a souped-up version of car simulators once routinely used in driver's ed courses). But that costs money, and MISTC is currently seeking additional funding to stay in business year to year. If the center and other R & D labs are successful in this arena, traditional surgical training methods -- many of which have been around for centuries -- could eventually be phased out. "One of the missions of the center is to develop virtual technology that eliminates the need for surgeries on animals," says Flint. "We would like to expand into virtual surgery using computer models with robotic instruments." Back in the MISTC lab, meanwhile, medical students who might someday test such advances gather around Brown as he finishes a perfect suture. They peer over each other's shoulders before going back to try again. "There is a Russian proverb," Brown is fond of saying. "Repetition is the mother of learning." Joanne Cavanaugh Simpson is a senior writer at Johns Hopkins Magazine.